Jeffrey M. Frank grew up in the suburb West Kildonan in Winnipeg, Manitoba. He credits his interest in the outdoors and peoples’ interaction with the outdoors to his experiences with nature as a child and teenager. This interest led him to pursue a Bachelor of Environmental Studies from the University of Manitoba. Upon his graduation in 1977, Frank began working as an Architectural Technician for the architect and planner Boyle Schaeffer. After a year working as a technician, he went on to work as a Field Landscape Architect for Duck Mountain Provincial Park in Manitoba. Frank then worked on the President’s Residence Project at the University of Manitoba as an Architectural Technician from 1980 to 1981. In 1981 he began working for the Winnipeg-based landscape architecture firm Hilderman Feir Witty and Associates, which would soon become Hilderman Witty Crosby Hanna & Associates. After only a year, Frank became an associate of the firm. While occupying this position, Frank received a Master of Landscape Architecture from the University of Manitoba. Graduating in 1984, his practicum thesis was titled The Yard: Exploring Integral Urban Design. After working for Hilderman Witty Crosby Hanna & Associates as an associate for seven years, Frank became a principal in 1989. Frank, along with landscape architects James Thomas and Heather Cram, acquired greater responsibilities within the firm and in 1997 the name of the firm changed to Hilderman Thomas Frank Cram. The firm changed its name again in 2013 to HTFC Planning & Design. Frank has remained with the firm for more than 30 years and is known for his ability to balance functionality with beauty. Frank has a passion for living with the land and is committed to community. These characteristics have made him an advocate for sustainable development initiatives and policies in Manitoba and throughout Canada. His expertise includes community and economic development, regional landscape analysis, and site planning and design. Frank has an extensive list of executed works, ranging in scale from small site planning to major urban projects, which are complimented by an impressive list of awards. One of Frank’s first projects with HTFC Planning & Design was the Tuxedo Shopping Centre, where he was responsible for the paving design as well as some grading and planting design. In the early 1980s, there was a housing boom in Winnipeg and as a result, Frank spent the majority of 1981 working on multifamily housing. This included laying out the parking lots and doing grading to make planting plans. In 1985, the year after Frank completed his Masters, he worked as the Project Landscape Architect on the Forks National Historic Park for Canada A.R.C. Manitoba. This project included preparing the design and project management for the national historic park at the forks of the Red and Assiniboine Rivers in Winnipeg. The project, titled Celebrating 10,000 Years: A Return to the Forks of the Red & Assiniboine, garnered Frank a National Honour from the Canadian Society of Landscape Architects (CSLA) in 1990. Frank’s successes continued on into the 1990s as he worked on some major projects. He was the Principal in Charge on the Township of Ignace Revitalization, a project that included conducting a study and creating a plan for the economic and physical redevelopment of Ignace. Over nine years Ignace implemented the tourism-focused projects that were suggested, including Ignace Library and Cultural Centre, in which Frank and HTFC were instrumental in the original planning and conceptual design of the facility. Frank worked with several other communities, such as Assabaska First Nations, the Township of Golden, and the Township of Atikokan, to create developmental plans with a focus on expanding their operations in order to generate more tourism. In 2008, Frank was the recipient of a CSLA Regional Citation for Music & People: The Winnipeg Folk Festival Site Master Plan. The Winnipeg Folk Festival is not only a major Canadian cultural event, but it is also seen as one of the most important international folk festivals. The master plan was founded on three major concepts: a main pedestrian street ‘venue,’ distinctive constellations of stage venues, and a customized main stage amphitheatre. In the early 2000s Frank also worked on the Dryden Gateway Project, Re-Inventing Fort Frances, the Red Lake Image Plan, Lac La Croix First Nation Resource Opportunity and Assessment and Action Plan, and the Nunavut Court of Justice. Some of Frank’s more recent projects include the Greenstone Sustainable Community Development Plan and the Sioux Lookout & Hudson Downtown Revitalization Study. A project that Frank began in 2000 and continues to work on is the Kenora Downtown Revitalization. This project has turned Kenora from an industry town to a popular tourist destination. The project includes transforming Main Street, the waterfront, and all other major public open spaces. This vast and ongoing project received a Regional Award for Design from CSLA in 2012. Frank has also been working with the University of Winnipeg on its Campus & Community Development plan since 2005. 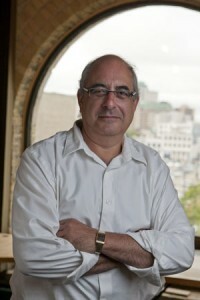 The University of Winnipeg is known for its efforts to create a campus that is socially, economically, and environmentally sustainable, and Frank’s work on the campus adheres to these efforts. For example, an aspect of the Campus & Community Development project included what is known as Portage Commons, the community green space located along Portage Avenue and Spence Street. Frank emphasized ecological sustainability by planting additional trees while preserving elm trees, reusing paving stone and other materials, and planting indigenous plants. There is also an activity plaza along the side of Wesley Hall where students and members of the community can come together for activities such as basketball and street hockey. HTFC is currently working on the student and family infill tower that will be located between the Buhler Centre and the Winnipeg Art Gallery. In addition to the projects mentioned above, Frank has been the Principal in Charge for well over 70 school, park, and health care projects. These projects often include site planning and design of vehicular and pedestrian circulations as well as site grading, landscape, irrigation, playground, and amenity spaces. Frank is a LEED (Leadership in Energy and Environmental Design) Accredited Professional, a member of both the Ontario Association of Landscape Architects and the Manitoba Association of Landscape Architects, and a fellow of the CSLA. In addition to his impressive project list and work with HTFC, Frank is an active member of the community and was awarded the Kavod Award for Community Service from the Winnipeg Jewish Federation in 2000. For eight years, Frank was on the board of directors for the B’Nai Brith Camp and spent 12 years as a volunteer for the Crescentwood Community Club. He has been on the board of directors for the Temple Shalom and the Winnipeg Folk Festival. In 2009, Frank was the chair of the City Winnipeg Urban Design Advisory Committee and he continues to be a periodic lecturer at the University of Manitoba in the Department of Landscape Architecture.